No More Nerve Pain | Podiatry Associates, P.C. ?What can the MLS pain laser treat? ?Can the MLS pain laser help my foot pain? Thank you Dr. O and staff! Sally W.
It was a blessing to have laser therapy done. Melissa H.
We all rely on an extensive network of nerves running throughout our bodies that serve to not only keep us alive, but also to appreciate the world around us. Nerves give us the ability to see, smell, hear, taste, and feel. These experiences enrichen our lives and keep us safe. When nerves are damaged, they can take away those abilities. More than that, there are times when nerve damage causes usual, painful sensations. If you have nerve pain in your lower limbs, Podiatry Associates can help! There are various causes of neuropath (nerve damage), which makes this a fairly common problem for many people. Nerves—particularly the peripheral nerves that transmit messages from all over the body to and from the central nervous system (your spine and brain)—can become damaged in traumatic accidents, from systemic diseases and illnesses, and due to exposure to toxins. 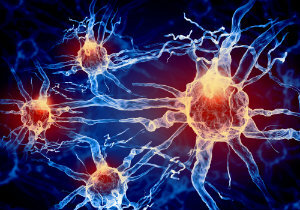 A particularly major cause of nerve damage is from diabetes. Medications – Mild symptoms can be treated with over-the-counter pain medications, but prescription painkillers are sometimes used for more-severe symptoms. Other medications that may be used in treating nerve damage include antidepressants, anti-seizure medications, and creams containing capsaicin. Physical therapy – This form of therapy is sometimes used in instances where muscle weakness is due to damaged nerves and can help improve the ability to move. Surgery – When neuropathies are caused by pressure from tumors, a surgical procedure can be used to relieve the pressure and improve the condition. A more highly-advanced nerve pain treatment we are proud to offer at our practice is Multi-Wave Locked System (MLS) laser therapy. This state-of-the-art therapy is noninvasive (no surgery!) and has produced amazing results for patients. It is virtually painless and sessions are fairly quick. That might sound wonderful, but what exactly is MLS laser therapy? In this treatment, laser energy (as you might imagine based on the name) is directed into specific areas of the body. With MLS specifically, there are two therapeutic wavelengths administered to reach deeper into affected tissues and target nerves affected by pain and inflammation. For more information on how MLS laser can help take away nerve pain, or to request an appointment for neuropathy treatment in the lower limbs, contact us online or call (303) 805-5156.